Razer has unveiled a brand new high-end Android-powered smartphone aimed primarily at the gaming market. Specs for the new Razer Phone had already leaked ahead of the reveal. The hardware features a 5.72 inch, 120Hz UltraMotion display, and is powered by the Qualcomm Snapdragon 835 Mobile Platform and 8GB of RAM. It also includes dual rear 12MP cameras and an 8MP front camera. 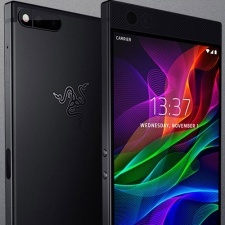 Razer is targeting the new smartphone at the games market, and to that end has partnered with a number of games companies including Tencent and Square Enix to optimise their games for its device. Other partnerships include Final Fantasy XV Pocket Edition, Gear.Club, Lineage 2: Revolution, RuneScape, Shadowgun Legends, Tekken, Titanfall: Assault and World of Tanks Blitz. "The future of gaming is rapidly expanding to mobile devices, and both Razer and Tencent are at the forefront of fast-tracking development," said Vincent Gao, global marketing director at Tencent Games. "Arena of Valor brings gamers a fast-paced, competitive experience, and the Razer phone was built to handle the visuals, sound and quick-reflex mechanics of the game. This partnership sets the standard for the next generation of mobile screen play." Razer has exclusively partnered with Three to be its launch mobile carrier in the UK, Ireland, Denmark and Sweden. The new smartphone is priced from £699.99 and will be available in North America, UK, Ireland, Germany, France, Denmark and Sweden. Pre-orders have started today and will go on sale on November 17th 2017. The news comes at the same time as Razer announced plans for a $550 million IPO on the Hong Kong Stock Exchange.